Download a copy of my latest media kit by clicking here. Christy Jordan’s SouthernPlate is a fast growing website with over 60 million page views per month. Folks who come to Southern Plate aren’t just readers, they’re family. We have a tight knit community (even with our large numbers) of real people looking to try real products that will help to enrich their day to day lives. Southern Plate has inspired readers everywhere to cook foods that come from the heart and from their heritage. 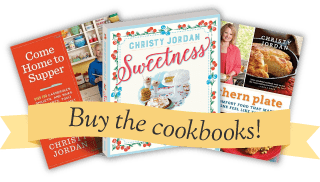 While Christy features recipes that typically have southern roots, the readers hail from all over the United States and beyond. They range in ages from 7-100 with an estimated 35% male readership, 65% female. Southern Plate can offer you many different advertising opportunities from traditional ad space in side bars, headers and footers, to ads embedded in posts, ads posted in the e-mail newsletter (currently with over 100,000 subscribers) and beyond. We also love to work with Companies on our highly active Facebook page which has over 190,000 Southern Plate Family members. While we would love to work with everyone, we are very protective of the Southern Plate readers. Your company and your product must be family friendly with no adult content. All ads must be considered and approved by Southern Plate. Please be aware that while we would love to work with everyone that contacts Southern Plate we are selective in who we expose the Southern Plate readers too and we also don’t have enough space to accommodate everyone. Christy recently released her first cookbook Southern Plate, Classic Comfort Food That Makes Everyone Feel Like Family (Harper Collins/WilliamMorrow Publishing) and has been featured in Southern Living Magazine, Guidepost, The Today Show, 700 Club as well as many other print and television publications across the country. She is working on her second book, was just named Editor At Large for Southern Living Magazine, and has several other exciting upcoming projects so stay tuned! Companies such as Nestle, Kraft, Hamilton Beach, Big Idea, Velveeta, Crystal Lite, Pepperidge Farm, Pioneer Brand, Wilton, Domino Sugar, Rhode’s Bread Dough, Country Bobs, House-Autry and many others. have chosen Christy and the Southern Plate brand as a platform to help them reach their targeted audience, trusting in the relationship she has built with her readers and the longstanding integrity of the Southern Plate brand. Contact: media @ southernplate.com for more information including advertising rates and availability. Privacy: Any email addresses provided to SouthernPlate.com will be used exclusively for the Southern Plate email newsletter and will never be shared or sold to other parties.Your trust in me is appreciated and I won’t break that trust. Occasionally, I will accept sponsored posts or products for the purpose of reviews. Some of these posts may be compensated. My opinions are my own and should be regarded as my personal opinions only. My positive opinion can never be purchased and I will not agree to a positive review in exchange for money, product, or any other form of compensation. Because that isn’t right. I sincerely hope anyone reading this knew that already though. 🙂 Now go forth and feed your family! Please tell me you are going to make a printable 2019 planner as you did for 2018?